My time of internship has past and this is the beginning of a new year where I am actually being paid for my services. In the time of my internship, I focused solely on meditative music and non-structured or music without the known melodies that everyone connects to so naturally. This was a bit of a struggle for me as I felt a bit unsure whether the music I was playing is acceptable and worthwhile for those whom I played for. The interesting part in all this was that the number of listeners grew in certain venues and in other venues I was invited to play one on one for most residents. I found myself questioning what I do and what the effect of the music is every time I set out to do my weekly sessions. After the sessions, I would come back inspired by the effect of the music on the mood of the listeners. The staff in the different nursing homes were so happy to see me every time I got there and said they felt so much calmer when I was playing the music for them. This is “my music” they were talking about! I really had to repeat this to myself over and over to understand that “my music” is good enough to inspire people who have never listened to my improvisations before. There were of course the people who requested certain songs, but sadly my memory banks for songs are very empty. I have never spent time to memorize songs as I always had to try and play music for a specific event such as weddings and funerals and did not learn my own repertoire from memory at all. I have been a “functional artist” up to this point and not a “performance artist” as I did not seem to make the cut for that type of gig. Well, here I am now, with not many songs in my repertoire that people like to listen to because I am quite insecure when it comes to playing songs, but I can read almost any music and now I can improvise music that seems to be quite palatable for people in nursing homes. This is my bit for today, but I hope to bring regular updates of my experiences from now on to both share what I learn and to hopefully inspire more people to take up and keep up with practical music in the future. I am excited to write that I am making myself availabe to play for concerts, weddings and special occasions of all kinds. After a bit of a sabaticle and moving to Melbourne, I am getting back out there to play. My music has a new feel about it these days as I am adding more of my own compositions and improvisations to the songs I play. To book your event, just complete the event registration form so I can contact you and discuss your special event. At this time I am not including any prices as it always depends on where and how long I need to play for you. My main aim is to get enough bookings in the year so that I can keep playing for the residents in nursing homes around Melbourne with out charge to them. So by booking your event with me you are looking after the music ministry at the nursing homes and providing music for the residents who can often not pay for the ministry they need. 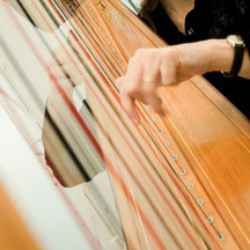 My Harp chat will be updated from time to time with topics around harp therapy and the experiences I can share with you when I visit clients. 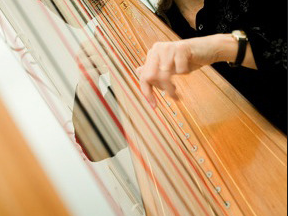 The chat will also include information around harp techniques and ways to play harp for those who use it as therapeutic instrument. If you want to contact me to ask questions, please do so via the contact form on the contact page. 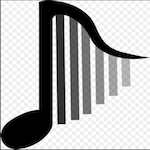 My Harp Link is created to promote therapeutic harp music by Anna Linky Muller and to book requests to play for harp music at events.